A charming restored trullo with pool in the olive-tree-carpeted landscape of the Valle d'Itria. Situated just outside the lovely old town centre of Ceglie Messapica, Casa Romigi offers an authentic and immersive taste of Puglian living. Whether you're lounging by the pool, dining al fresco late into the night or snoozing under the shade of an olive tree, life at Casa Romigi is both relaxing and revitalising. Inside: accommodation at Casa Romigi is all on one level. 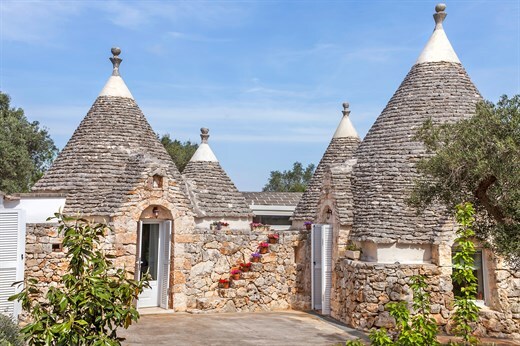 The property, consisting of five trulli cones and a couple of lamie (another typical Puglian construction), is full of character and has been sensitively restored to create a light-infused, spacious environment, furnished with comfort and homeliness in mind. A pair of glass sliding doors access the bright, generously proportioned living area, which is comfortably and charmingly furnished with large sofas and a cosy daybed near the fireplace. A door leads from here to a large, double-aspect kitchen-diner, looking out over and accessing the gardens and al fresco dining areas on two sides. Another door in the living area opens into the master suite comprising a panoramically-placed double bed and an en-suite bathroom with tub and shower attachment. Back in the kitchen, a door leads into a corridor, off which, in one of the trulli cones, is a double bedroom with en-suite bathroom with tub and shower attachment and access to the gardens. Continuing along the corridor, passing a shower room and a laundry room, one comes to an elegant, welcoming trullo cone hallway, furnished with a sitting area and day bed. From here one accesses the remaining bedrooms: two double-twins, each with its own en-suite bathroom with tub and shower attachment. One of these rooms also has its own access to the surrounding gardens. Outside: Casa Romigi is set in an extensive garden, much of which is planted with centuries-old olive trees. Immediately surrounding the house are a series of paved terraces, furnished for lounging and dining and accessed from the kitchen-diner, the living room and two of the bedrooms. The main terrace, which is accessed from the kitchen-diner, leads to a large expanse of lawn on two levels, the upper part of which is home to the lovely pool area. Mature trees provide shade for an afternoon snooze amidst the peace and quiet of the Puglian countryside. The lovely views from the living room, the fireplace, the spacious kitchen and central heating make Casa Romigi a cosy option for anyone travelling in spring and autumn. Casa Romigi is situated at the southern end of the Valle d'Itria between Ostuni, a beautifully restored baroque town with stunning panoramic views, and the pretty centre of Ceglie Messapica. The Valle d'Itria, however, is probably best known for its trulli, and nowhere are these more in evidence than in the picture-postcard town of Alberobello. Locorotondo, Cisternino and Martina Franca are also well worth a visit. If you are looking for beaches, the Adriatic coast offers long stretches of sand and some well recommended lidos from which to enjoy it. Further afield, Lecce, Gallipoli, Otranto and Monopoli are justly famous towns waiting for you to unlock their secrets. "Our week at Casa Romigi was most enjoyable. The villa was of a high standard and all the information provided was detailed and very helpful. We loved the villa and the location." We were very happy with Casa Romigi. Our holiday couldn't have been better. Our week at Casa Romigi was most enjoyable. The villa was of a high standard and all the information provided was detailed and very helpful. The owners added great value to the holiday, the staff-cooked delicious suppers. We loved the villa and the location. Great villa and grounds. Another great family holiday with you in a unique property. We enjoyed the combination of visiting the charming towns and relaxing at the comfortable villa. The staff were wonderful, always there for us. Everything at Casa Romigi was great. The housekeeper and the welcome provisions were great. 5 stars all around. If we just spoke about the property, it would be 5 stars. Casa Romigi is like a home rather than a rental villa. What really pushed it over the top was the caretakers who were like the kind neighbors next door when you move in to a new house. We did the in-villa cook twice and must say that not only great value for money but Pina's food was on par with many of the restaurants we went to! What we enjoyed most about our holiday? The villa - we could have just stayed in the villa and it would have been a fabulous holiday. We loved Casa Romigi. It was meticulously cleaned and the arrival welcome basket was delightful, thorough and very considerate. I will use you again, no doubt! Maybe even this year,,again! The setting of Casa Romigi was perfect, the value just right. We loved every minute of our holiday. The staff was outstanding - kind, helpful, excellent. Above and beyond. I would love to use your services anywhere/everywhere because you truly are unrivalled in the field.